Weintraub is pleased to welcome Allison M. Pedrazzi to our Trusts & Estates Group. Allie works with families and individuals in all aspects of estate planning, trust and probate administration, and related real estate, tax and business succession issues. Weintraub is pleased to announce that Jo Dale Carothers has been recognized as a 2019 San Diego Super Lawyer and Eric Caligiuri as a 2019 Rising Star. Weintraub is pleased to announce that Josh H. Escovedo has been named a Top Author, for the topic of trademarks, in the JD Supra 2019 Reader’s Choice Awards. “You put everything together, and it encourages people to loosen up,” he said. Weintraub is pleased to welcome Carlena Tapella to our Trusts and Estates Group, where her practice includes a wide spectrum of trust, estate, and conservatorship litigation and administration. Weintraub welcomes Andy Liu to the firm’s Intellectual Property and Patent practices. A registered patent agent, Andy has managed patent portfolios for large technology companies and assisted software and electronics startup companies with their IP strategies. Weintraub is pleased to welcome Brigitte Alanis to the Entertainment and Digital Media groups, where her practice includes music, digital media, endorsements, branding, licensing, television and film. Weintraub litigators were in the news this week as their client, local restaurant owner Jared Katzenbarger, filed suit against Dickey’s Barbecue Restaurants, Inc. The lawsuit is in response to Dickey’s demand that Mr. Katzenbarger enter into arbitration regarding Dickey’s franchise restaurants that Mr. Katzenbarger has since closed and replaced with original concept restaurants Jyro’s Twisted Gyros and Side Burn BBQ and Beer. Leslie Kolafa joins the Trusts and Estates group as an associate. Leslie practices in trusts and estates litigation, and also assists clients with estate administration, conservatorships, and fiduciary representation. 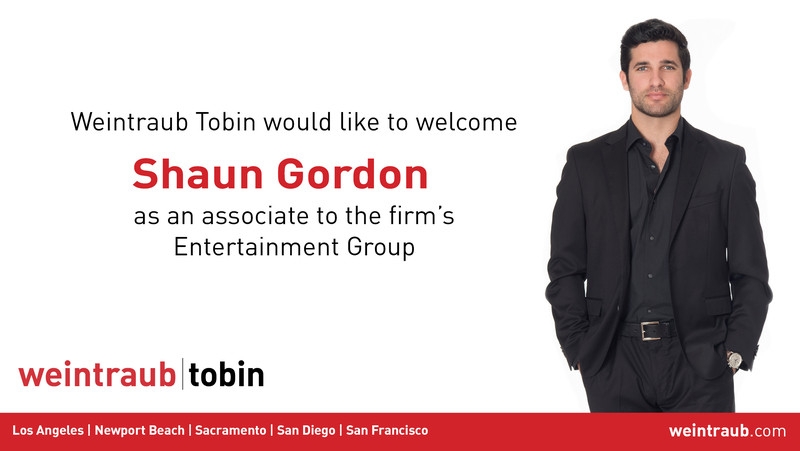 Shaun Gordon joins the firm as an associate in the Entertainment Group. Prior to joining Weintraub, Shaun was a senior director in business affairs at Awesomeness, where he negotiated and managed deals across all verticals with a focus on feature films, series, short-form digital projects, and brand partnerships. We are pleased to announce the publication of the sixth edition of California Leave Law: A Practical Guide for Employers, co-authored by Weintraub Tobin Shareholder, Lizbeth (“Beth”) West, and published by Matthew Bender/LexisNexis. Sacramento, CA, United States, November 1, 2018 — U.S. News & World Report and Best Lawyers, for the ninth consecutive year, announce the “Best Law Firms” rankings. Weintraub Tobin Shareholder Matt Sugarman is excited to announce that Will Smith and Marc Forster’s Telepool backs Defiant Studios Horror Film slate. ‘Phobias,’ a horror anthology, will be the first project produced under the agreement with Eric B. Fleischan’s Defiant Studios, with Kodiak Pictures and Telepool as co-producers and co-financiers. To read the full article, visit The Hollywood Reporter here. Lizbeth will discuss the still hot “Me Too” topic and how it impacts family business. SACRAMENTO, California – August 24, 2018 – Weintraub Tobin Chediak Coleman Grodin Law Corporation congratulates its seventeen attorneys who have been included in Sacramento Business Journal’s Best of the Bar 2018. SACRAMENTO, California – August 15, 2018 – Weintraub Tobin congratulates its nineteen attorneys who have been included in The Best Lawyers of America© 2019 list. SACRAMENTO, California – July 19, 2018 – Weintraub Tobin Law Corporation congratulates its 24 attorneys who have been included in Sacramento Magazine’s 2018 Top Lawyer List. Super Lawyers has released its Northern California, Southern California and San Diego lists of outstanding attorneys for 2018, on which 37 Weintraub Tobin attorneys have been included. Five Weintraub Tobin attorneys received special recognition as a Top 25 Sacramento Super Lawyer. Webinar ” Let’s Talk About Wage & Pay in the Restaurant Industry”. Sherry Bragg co-authored an article on “The Case for More Vacations” and Darrell White is featured on the cover as part of the highlight on leader’s in Orange County affiliate bars. Specifically, the Hispanic Bar Association of Orange County where Darrell is serving as President. In the ever-changing landscape of digital content, knowing how to navigate the legalities of using video or music you don’t own is tough. Experts Scott Hervey (Weintraub|Tobin) and Rian Bosak (SuperBam!) will walk you through fair use, parody, and what it looks like for rights managers in the field so you’re prepared to make great content within the bounds of the law. Make-A-Wish grants thousands of unique wishes each year. A lot, yes. But that’s only 50% of eligible kids. Weintraub Tobin is fundraising so more deserving kids and their families can know the happiness, hope, and relief a wish can bring. Weintraub Tobin will be matching donations received during this fundraising campaign. Follow this link to our fundraising page. Litigation Attorney Josh Escovedo was featured in an article in the Sacramento Business Journal in which he weighed in on The Mimosa House’s suit against Eliud Moreno and EO United LLC, the owner and operator of Friends with Benedicts. Josh represents Moreno saying, “We believe this is anti-competitive litigation being pursued by The Mimosa House to minimize their competition in the area,”. Weintraub Tobin Shareholder, Beth West, shared her expertise and testified before the California Legislature’s Subcommittee on Sexual Harassment Prevention and Response on February 15, 2018. The hearing focused on the legal issues surrounding sexual harassment and Ms. West’s testimony identified challenges employers face in having effective anti-harassment programs in place, as well as some legal challenges employers face when complaints are filed. Ms. West has over 18 years of experience representing employers in all aspects of their employment relationship with their employees. LOS ANGELES, CA (January 30, 2018) – Weintraub Tobin, one of California’s leading, full-service law firms, is pleased to announce that Sherry Bragg, David R. Gabor, Andrew Gilford and Gary Waldron have been named to the 2018 Southern California “SuperLawyers” list. The annual publication recognizes no more than 5.0 percent of lawyers throughout Southern California. Sherry Bragg – Sherry S. Bragg is a shareholder in the firm’s Litigation Practice. Congratulations to our client in its closing today of the sale of 621 Capitol Mall in Sacramento, California. We are pleased to have represented them in the sale of this trophy property, to a major institutional investor.